My first morning on the island dawned sunny and cool. I needed breakfast, and found the post office. At home that wouldn’t help, but here it was perfect. The post office is not just a place to mail letters; it is also gift shop, bake shop, ice cream shop, general store, bed and breakfast, and a restaurant, all in one cozy little storefront! I ordered an egg on a waffle with a cup of tea and drank it sitting at a little bistro table on the sidewalk outside. As I watched a steady stream of locals come and go, I realized that this is also a morning meeting place where neighbours pick up their paper and chat about weather, family and how their garden is coming along. Class would begin today but not for a few hours, so I went to spend some time in the Gospel Garden, only a stone’s throw from the Post Office. The Lindisfarne Gospels is an illuminated manuscript that was created here in the seventh century to honour St. Cuthbert and despite all odds has survived to this day (it is displayed in nearby Durham). The garden was originally created as an entry for the prestigious Chelsea Flower Show in 2003 (it won silver) and then recreated here on the island. It seeks to echo the colour and beauty of the original artwork. Going through the gate, I was immediately taken by the vibrant colour. I wish I knew the name of the yellow and orange flowers that are blooming in huge swaths, but they are a mystery to me. 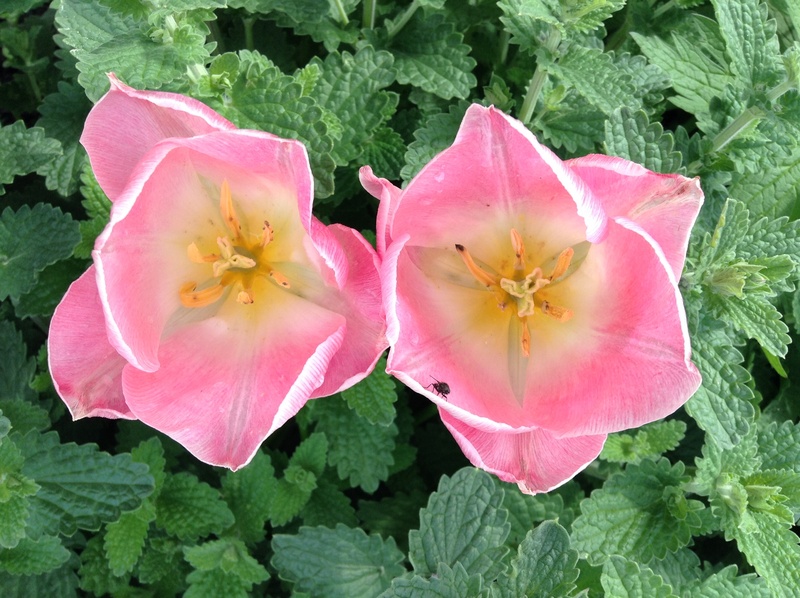 Alongside them were bluebells and yellow narcissus, pink tulips and purple creeping phlox that was showing its first few blooms. Farther in, I could see that small boxwoods had been planted in a celtic knot work pattern. 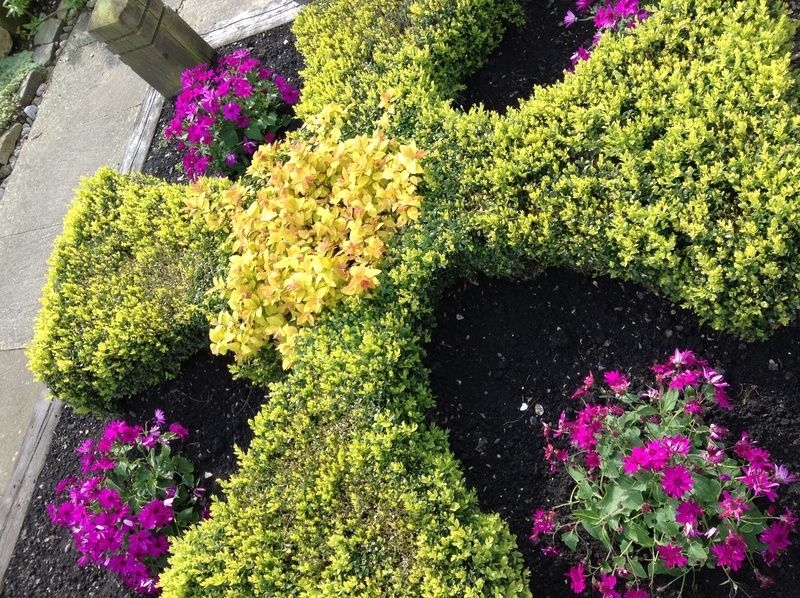 In the centre was more boxwood, planted and trimmed into the shape of a cross. A large wooden celtic cross is displayed, along with several other carved wooden sculptures. Everywhere I turned there was something beautiful to look at. I paused in my tour of the garden to watch a small grey mouse. He paid no attention to me at all, if he even noticed I was there. He was very busy moving small bits of wood from one place to another, scurrying underneath the arched green leaves in a small stand of ferns and bluebells. I left him to his work. Not being in a hurry (which is so decadent) I sat on a bench in the sunshine. Warm and sheltered, I had a few moments to consider that this carefully planned and cultivated space is quite different than the wild and rugged nature I walked through on my journey here. Beautiful, all of it. As I lingered in the garden, others happened along. But the strangest thing happened: as soon as they came into the stone enclosure, their voices naturally hushed. Perhaps they saw me and wanted to respect my quiet enjoyment. Or perhaps such a special place simply inspires reverence. At last I was on my way to meet my classmates and begin my course on Celtic Spirituality. The afternoon and evening were packed with introductions and learning, which made me all the more glad that I had begun with the calming power of God’s creation. 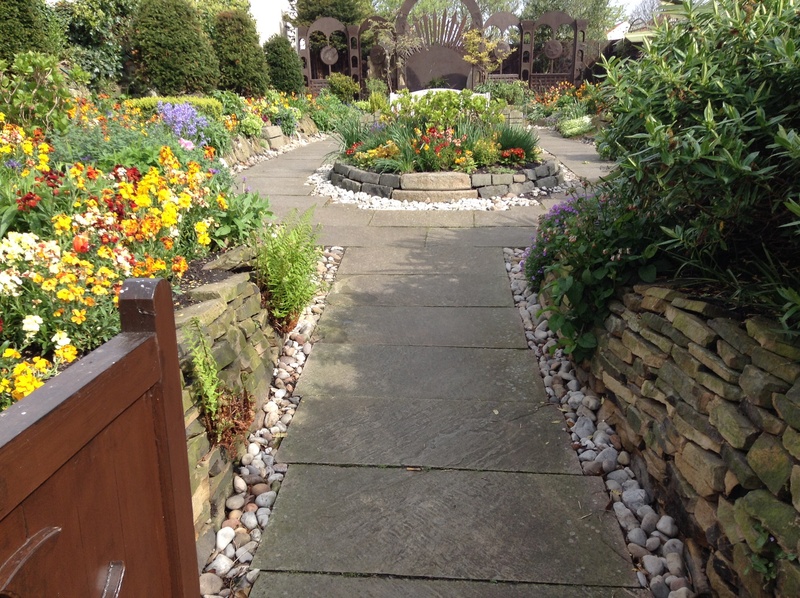 This entry was posted in Uncategorized and tagged garden, Lindisfarne, rest, St. Cuthbert's Way. Bookmark the permalink.